Butchers are a great bunch, aren't they? They chop things up. They serve you meat. And they're generally overweight and happy chaps all round (pun intended). Also, for some strange reason they're all married to the same woman called Mildred too. Or was that just a dream I had? Anyway, to emphases what I am trying to say, watch this film Directed by Yuen Woo-Ping; and Starring: Sammo Hung and Yuen Biao. It was made in 1979, and lasts for 108 minutes. Once upon a time in frugal China there lived an idiot called Porky (Sammo Hung). Well, Porky was the type of person whose able to annoy his reverent Kung-fu master, Wong Fei-Hung (Tak-Hing Kwan). Plus beat up his long lost brother, Lam (Kam Chiang), by defending the scoundrel, Ko Tai-Hoi (Hark-On Fung), on the street. OK, I have to admit, that when Porky fought Lam, he did not know that he was his long long lost brother. Or that Ko kidnapped Lam's wife earlier -- thus the reason for this debacle. Still, that is what Porky did. So what can Lam do about it huh? Hang himself? Yes. He tries to do just that actually. But thankfully, by chance of fate, he is saved by the martial art's drunkard, Beggar So (Fan Mei Sheng), whom then attempts to resolve Lam's problems in his unusual lush ways. He confronts Ko at a winery. He gives Porky a slap at a cafe. And he then rejoins Lam with his long-lost brother at home, before they all go and save Lams wife post-haste. However, do you think that these three martial musketeers are able to accomplish this mammoth task? Err. Yes. Of course they do. But in so doing, that also take back with them the goddaughter of Ko's master, called Master Ko (Hoi Sang Lee), which isn't really a nice thing to do considering that he hates Porky's teacher, Wong Fei-Hung. Moreover, to make matters even worse, the Goddaughter is killed sometime later. No. Not by Porky. By Ko. The scoundrel not the Master. Who then blame this on Porky. Oh! Well I suppose that is why what next transpires really turns into a dark and sordid affair all in all. As peopled are killed - porky gets skilled - night watchmen are slaved - and Wong Fei-Hung is dismayed. When I first watched 'The Magnificent Butcher' quite sometime ago, I have to confess, this movie did take me by surprise. I was half expecting this flick to be the usual run of the mill chop-sockey action piece from that era. Comprised of a mumbled plot-line, bad dubbing, and the usual visual continuity that is all over the place. OK, so I was correct with my presumption really. More than correct. But what I was completely wrong about where this movie was concerned, was everything else. You see, this Hong Kong extravaganza is strangely refreshing and exuberant in tone, pace, and style. The film begins as if it were a naive comedic kung-fu film - all nicely presented, acted, and choreographed to boot. But then over half way through it, the film turns much darker, and people are getting killed left right and center. Just think of it as watching 'Austin Powers' for the first 50 minutes or so, and then it changing to 'Goodfellas' towards the end (click on links for the review). Please note, I am not trying to imply that this is a bad thing in retrospect. Because it's not. Instead, it is just something which took me by surprise when I first watch it. Captivating me enough to become enamored with the actors, the plot, and the true story behind this project. Also, another thing which took me by surprise, is the dynamic fighting in this film. Granted, Sammo Hung and Yien Biao are here - so you know you are in for a real treat. But the way in which the other actors move, and the set piece are shot by the director, Yien Woo-Ping, this really is a wonder to behold. Think of it like an oriental version of 'violent dancing' with a story-line. Here, check out some of these related filmic facts to see what I mean: (1) Originally Siu-Tien Yuen was going to play Beggar So as he did in 'Drunken Master' [click here for review]. But when he died during production, he was replaced by Mei Sheng Fan, causing the nature of this film to change quite a bit. For example, Lee Hoi-San characters was not played for comedic effect anymore. Whilst a different actor played Porky's brother. He became the beard butcher in the market-place. (2) Yuen Biao inherited the 'Yuen' part of his name from his Peking Opera School Teacher, Yo Jim Yuen. Whereas the 'Biao' part of his name comes from the word 'youthful tiger'. He went to this place of learning with Jackie Chan and Sammo Hung. (3) Tak-Hing Kwan played Wong Fei-Hung in over a hundred films, and was also a big fan of the western movie genre. When he died he was buried in America with his second wife. (4) Yes. You did hear the Popeye theme tune in this movie. Replacing spinach for wine. (5) Yuen Woo-Ping's nickname is 'Big eyes'. (6) Sammo was supposed to reprise this role in the film 'Once Upon a Time In China' [click here for review]. Also, like the character he play in this film, Sammo's family comes from a martial arts / Pecking Opera background. 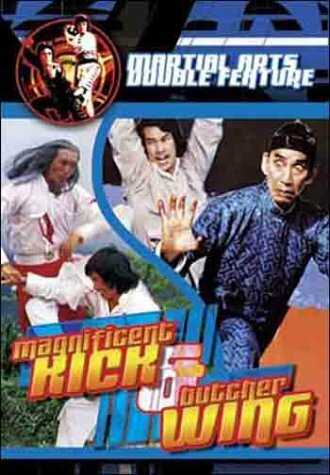 And (7) This film is known by 'The Magnificent Butcher', 'Magnificent Kick', and 'Butcher Wong' for no apparent reason what so ever. Now if you have not guessed by now -- correct -- I am a big fan of 'The Magnificent Butcher'. In my mind it is one of those films that had to be made so it could preserve and carry on the legacy of a great man, whist at the same time continuing a trend of Kung-Fu comedy in Hong Kong cinema. Granted, this true story is mostly fictional. The tone of this flick is divisible by two. Plus the dubbing is just dire. Nevertheless, the style, the message, the martial arts, and the acting, are just out of this world. Setting this project within the pantheon of other cinematic greats of it's ilk. Brilliant film - perfect martial arts – funny voices – and can be somewhat shocking as well.